Working typography onto ceramics came about after an experimental collaboration with poet Jenny Bornholdt and ceramic artist, Raewyn Atkinson. We combined our different skills and made Pitcher with Women, a set of three vessels each containing a part of a poem Jenny had written after Picasso. The words wind their way around each form inside or out, black on black. For the vessel pictured, a different project, we worked with a light band to carry the words. 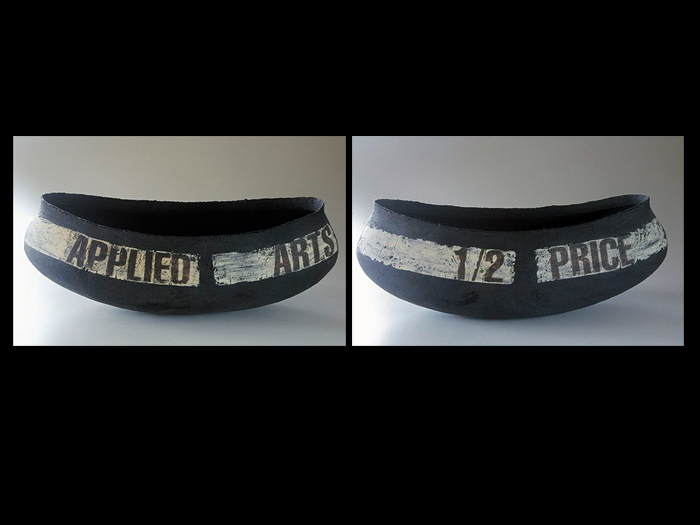 Protest Vessel, 1/2 PRICE was made specifically for the Norsewear Art Awards in protest over the unequal awards offered between fine arts and applied arts. The following year the awards were adjusted to equal amounts.